I never thought that I will own a winter white leather jacket but Joe Fresh made it happen. Even though I was tempted to keep this look white all the way, I inserted a splash of burgundy color and a fun print to create a visual contrast interest, excitement and drama. this bag even cant be more perfect than with all white ! Oh! That white leather jacket and those heels – LOVE THEM! It’s absolutely marvellous how a full white ensemble can be so strikingly awesome. The splashes of bordeaux give it such a twist and you are a true beauty! OMG!!! Gorgeous jacket and the booties are a wonderful compliment. OMG! I’m in love with your boots! Incredible look. That bag and those boots! 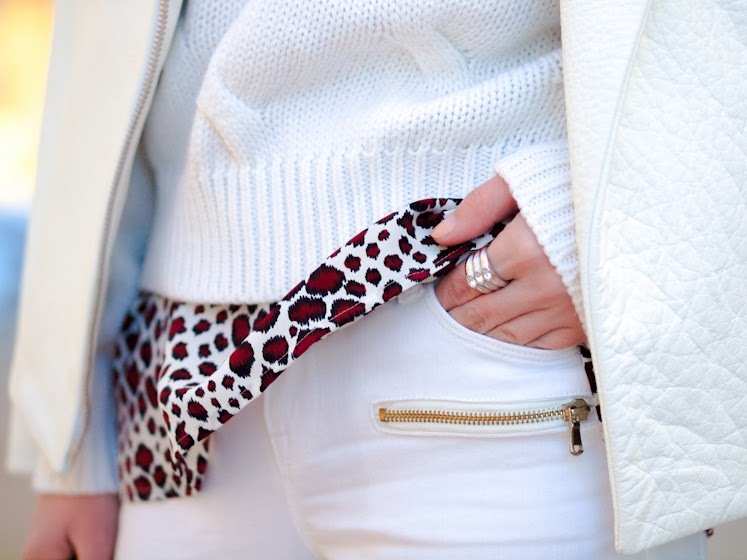 The animal print is such a nice contrast with the rest of the outfit! I love this complete outfit! White is beautiful in the winter! and those booties are amazing! Love the leopard shirt..but that purse is incredible! Absolutely stunning look. I love the accent of burgundy – perfect.